Adult red deer (Cervus elaphus) are medium-sized and round-antlered, with a uniform, plain brown body, lighter below. 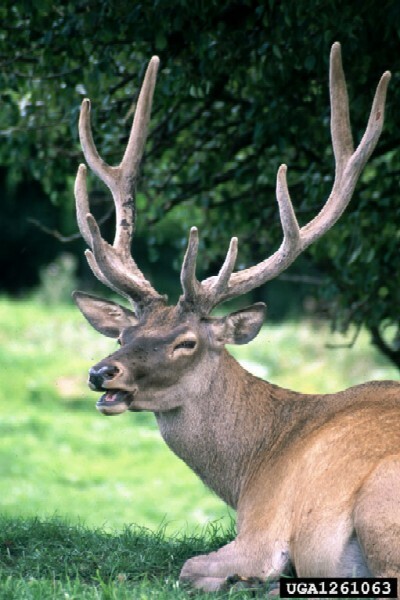 Mature males have antlers with 10 or more tines, the uppermost pointing upwards in a cluster. The muzzle is blackish and hairless, and the hooves are grey to black. Both sexes are similar in colour. Adults typically have no spots, newborn fawns are brown or reddish-brown with a dark dorsal stripe and a creamy to light brown rump patch. 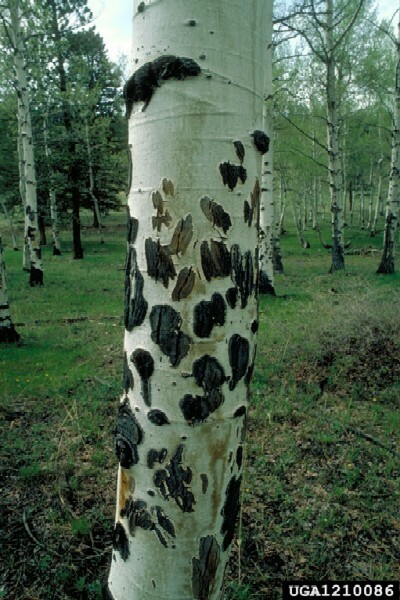 White spots are scattered on the back and flanks (Nugent and Fraser 2005). Female live weights are 100-150kg, male live weights 200-300kg. In southern Latin America the invasion of red deer (Cervus elaphus) has occurred in temperate rain forests, ecotonal areas and tree-less steppe areas. The invasion is encouraged through plantations of exotic conifers in ecotonal and steppe areas. The only important predator is the native puma (Puma concolor). In Patagonia, sexual maturity of red deer (Cervus elaphus) females is at 1 or 2 years of age; gestation lasts approximatly 240 days; males reach their maximum development at 12-14 years of age; life span in the wild in both sexes is 18-20 years. Red deer (Cervus elaphus) have been used to stock game parks for recreational and trophy hunting. Red deer have been farmed for venison, velvet and skins/hides, as well as\r\nfor Asian medicines using antlers, velvet, tails and testicles, and teeth for jewellery (Auckland Regional Council- PestFacts). The habitat types occupied by red deer (Cervus elaphus) in southern Chile and Argentina include native forest types and grasslands and modified vegetation types. Currently red deer are established in most forested habitat types encountered between about 34E and 55E S. Inhabited native vegetation types include: alerce forests, Fitzroya cupressoides; Araucaria forest, Araucaria araucaria; Cordilleran Cypres forest, Austrocedrus chilensis; Roble-Rauli-Coihue forest, Nothofagus obliqua, N. nervosa, N. dombeyi; Rauli-Tepa-Coihue forest, Nothofagus nervosa, N. dombeyi, Laureliopsis philipiana; Valdivian Rainforest complex; Lenga forest, Nothofagus pumilio; Nire forest, Nothofagus antarctic; Magallan Coihue forest, Nothofagus betuloides; alto-Andean vegetation; Patagonian steppe; wet meadows and riparian wetlands; brush and grassland of anthropogenic origin - e.g. forests cleared for livestock; agricultural areas and forest plantations. The present distribution of red deer has the following environmental characteristics: it covers the latitudes between 37E 42' S and 54E 55' S (non-contiguous); the longitudes between 73E 36' W and 69E 50' W (non-contiguous); and altitudes between 300m and 2,450m. Normally one offspring per female. In some parts of Argentina, 10-30% of yearling females breed. 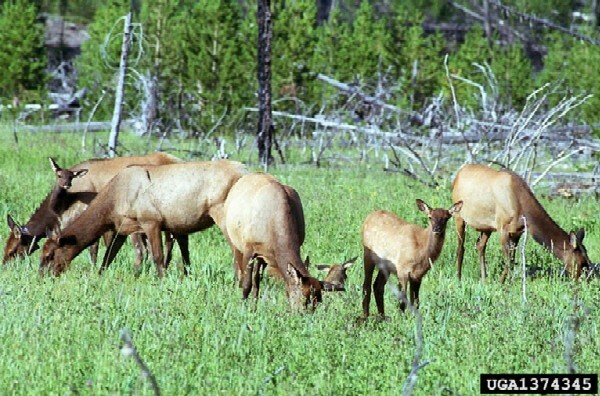 The dietary breadth of red deer (Cervus elaphus) is evidenced by the habitat types invaded so far, which range from temperate rain forests to cold-dry steppe habitat. Females feed on the more lush habitats whilst the males prefer the poorer feeding areas. Review: Dr. Werner T. Flueck, Consejo Nacional de Investigaciones Cientificas y Tecnologica and Centro de Ecologia Aplicada del Neuquen, Argentina. 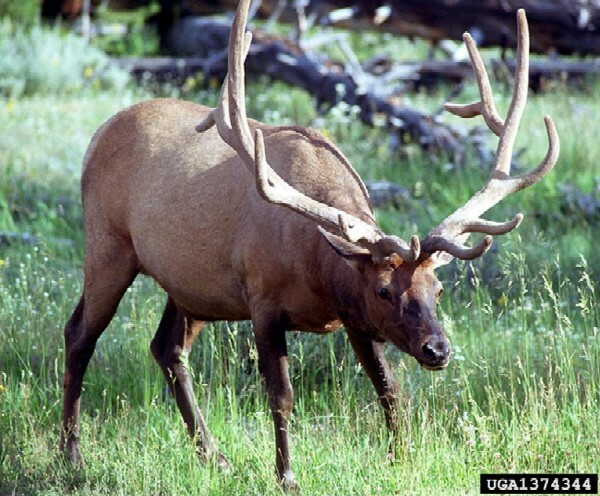 Recommended citation: Global Invasive Species Database (2019) Species profile: Cervus elaphus. Downloaded from http://www.iucngisd.org/gisd/species.php?sc=119 on 19-04-2019. In South America there is now evidence of extensive dietary overlap of red deer (Cervus elaphus) with an endangered native heumel (see Hippocamelus bisulcus in IUCN Red List of Threatened Species) and likely with guanaco, another native ungulate. Red deer have reached high densities locally with measureable effects on the flora (Flueck, W., pers. Comm., 2003). Deer prevent regeneration of favoured plant species, which causes significant changes to the structure and composition of native ecosystems. 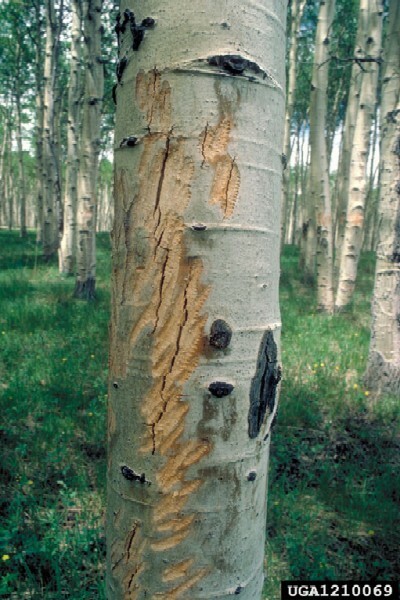 At critical sites, non-replacement of canopy species can lead to canopy collapse. There is no evidence in New Zealand, Chile or Argentina, that equilibrium has been reached between deer and the native ecosystems they inhabit. Deer continue to inhibit forest regeneration even at low density (Department of Conservation Policy Statement on Deer Control, 2002). 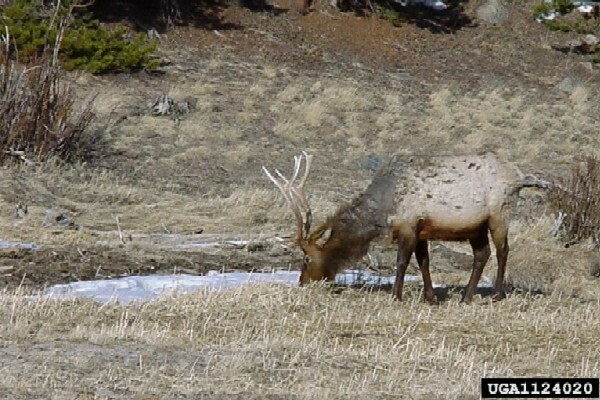 The Risk assessment for the Red deer (Cervus elaphus), has been assigned a VPC Threat Category of EXTREME. Physical: In Argentina, wild red deer (Cervus elaphus) are generally treated as a resource, mainly for trophy hunting, and currnently there is no comprehensive strategy to monitor and control populations. Although considered an unwanted invasive species in National parks, current manipulations are restricted to trophy hunting. Only where densities have reached high levels on some private lands, red deer are specifically culled to decrease the density. Several provinces and National parks with wild red deer have established their hunting regulations, though not being based on population characteristics or conservation goals (Werner, F., pers. comm., 2004). \r\nIntegrated management: The Department of Conservation in New Zealand has released a policy statement on deer control, (Department of Conservation Policy Statement on Deer Control, 2001), which adopts an integrated approach to control of deer, working with all interest groups. Please follow this link for a case study on the management of red deer in New Zealand compiled by the IUCN SSC Invasive Species Specialist Group (ISSG). Informations on Cervus elaphus has been recorded for the following locations. Click on the name for additional informations. Crouchley, D., Brown, D., Edge, K. and McMurtrie, P. 2007. Secretary Island Secretary Island Operational Plan: Deer Eradication. Department of Conservation: Te Anau. D�az, N. I. and J. Smith-Flueck. 2000. The Patagonian huemul. A mysterious deer on the brink of extinction. Literature of Latin America, Buenos Aires. 149 pp. (English and Spanish version available). Department of Conservation (DOC), 2001. Policy Statement on Deer Control, 2001. Summary: Management and Deer control policy- New Zealand. Duncan, R., Ruscoe, W., Richardson, S. and Allen, R. 2006. Consequences of Deer Control for Kaweka Mountain Beech Forest Dynamics (Landcare Research Contract Report: LC0607/021). Summary: Impacts of red deer on native mammals. Flueck, W.T. J.M. Smith-Flueck, 1993.�ber das in Argentinien angesiedelte Rotwild (Cervus elaphus L., 1758): Verbreitung und Tendenzen. Zeitschrift Jagdwissenschaft, Vol. 39, No. 3 (153-160). Summary: Red deer Distribution in South America. Flueck, W.T, J.M. Smith-Flueck, and K.A. R�egg, 1995. Management of introduced red deer in Patagonia. (J.A. Bissonette and P.R. Krausman, eds.). Integrating people and wildlife for a sustainable future. Proceedings of the first International Wildlife Management Congress. The Wildlife Society, Bethesda, Md. 525-528 proceedings. Summary: Management of introduced red deer in Patagonia. Summary: Red deer Distribution in southern latin America. Summary: Notes on red deer in Argentina. Fraser, K.W., Parkes, J.P. and Thomson, C. 2003. Management of New Deer Populations in Northland and Taranaki, Science for Conservation 212. Smith-Flueck, J.M. 2003. La ecolog�a del huemul (Hippocamelus bisulcus) en la Patagonia Andina de Argentina y consideraciones sobre su conservaci�n. Doctoral thesis, Univ. Nac. Comahue, Argentina. 361 pp. Summary: Notes on competition and impacts. Coomes, D.A., Allen, R.B., Forsyth, D.M. and Lee, W.G. 2003. Factors Preventing the Recovery of New Zealand Forests Following Control of Invasive Deer, Conservation Biology 17 (2): 450�459.